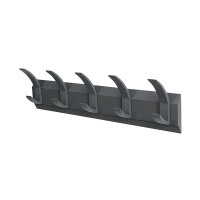 This premium quality coat rack is coated in a textured graphite finish, providing both style and durability. Easily mounted to most wall surfaces with the included mounting kit, the hidden screw and hook fixings create a modern and slimline appearance. This rack contains 5 hooks for use in offices, schools and more.